Previous postA Joke … or a Gag? 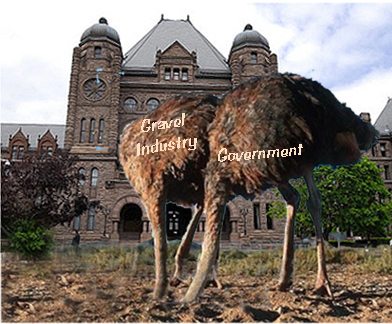 I have some friends living in Grey County very vocally opposed to the Quarry. I also live in a neighbourhood peppered with signs against it. I want to write about it for a very long time from my libertarian perspective. How ironic, a good friend came into the pub, where I work, last night and we engaged in this very topic. I will be pushing your blog on to him in hopes it will enlighten his concerns. Right now he told me if he puts a couple of spruce trees up in the right location he won’t even see the wind turbines. Also if he closes his east window he hardly hears the hydro sub-station installed a few years back. This is where most of us stand when it comes to these damaging disamenities, just trying to live with it because we like where we live and fighting it will only cause misery. The system will just, as usual, shove us aside. These friends and most of us don’t have the capital or the time to fight the fight. We want to live our life even if the price of everything around us constantly goes up, and now look, our retirement asset has just gone down. One buys a country setting for the beauty, privacy and peace that comes with it until something like this happens. They were totally unaware 15-20 years or so ago that this would happen, and now, just try to adjust. Should they not have been informed upon purchasing this property? Surely someone knew of its future woes. Your blog will surely open his eyes and I hope gives him the feeling that not all is lost. Maybe just maybe the light at the end of the tunnel will shine for us instead of the bureaucrats who forever live higher as we live lower. Where do we go to beat up on this bullying system and how do we win? Location, location, location……..is there really one?